Eco100 offers a specially formulated amalgam filter to help dispose of potentially harmful mercury from metal fillings. In many countries there are legal protocols that must be followed when discarding amalgam from filters in the dental industry. However, the United States is not one of them, although many states and cities have taken their own legal action. Currently much of the amalgam from fillings is ultimately disposed of in waste water treatment plants and sewer systems, thereby contaminating the water and potentially, the environment. 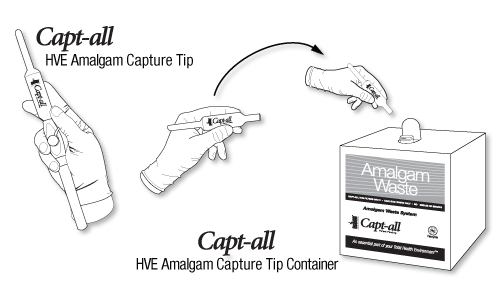 Eco100 provides an amalgam capture tip and disposal system that elevates amalgam from ever ending up in the environment.